Upon an early Summer’s eve, far north in the Outer Isles, people from settlements and nomadic camps have come from all around. About the base of three standing stones they dance, chanting a rhythmic incantation to welcome the Sacred Man of Fertility, the one who inseminates the womb of the Mother Goddess that life prolific may bless the land for years to come. 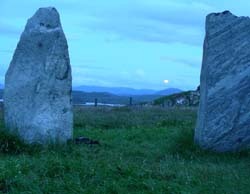 As the glow of the Moon glimmers behind the range of hills to the Northeast the procession of the gathered peoples spiral in their dance, interweaving between the Three Tall Women – the three standing stones – and make a grand loop around the singular standing stone set apart from the Three. This lone stone is recognized as the Sacred Man. The granite obelisk has been worked so that the veins of white quartz within it show themselves to be erupting from the very top of the post, then spilling down its sides, as the very substance of male generative empowerment. At the base of this standing stone, on its eastern side, stands a man, the Consecrated Masculine, whose regalia is of the softest and purest white deerskin. Upon his head is perched a rack of antlers. He stands entranced, waiting for a precise momentous event to awaken him. Remaining at the base of the Three Tall Women are three Sanctified Women, each representing a stage of life of the Feminine, and each an earthly embodiment of the three stars perched directly overhead. Leftmost, at the white triangle shaped stone, is the Maiden, the earthly embodiment of the star Deneb. In the middle is Mother, dressed in an earthen red, she who carries the generative force of the Feminine, and Vega is her star above. To the far rightmost, southeastern in position, stands a black rock and a woman garbed in black. She holds the ancient knowledge of the Feminine as the Elder Woman. It is to the star Altair that she gazes upon for transmission of Wisdom. While the gathered peoples sing, the robed man – the Sacred Man – holds his arms outstretched in the gesture of embracing the Moon. He leans firmly into the pillar of stone at his back. The life-giving essence of Mén-zu is channeled through the Sacred Man and into the stone, where its Power is grounded, charging the stone with life-force, holding it as a vessel does water, to be distributed as the land requires during the 18 years to come. Around the neck of the Sacred Man is a singular strand of pearls wrapped as a necklace. From the first bead – a large fiery opal, every 18th bead is replaced with a round bead of the blackest jet followed by 8 tiny beads of crystal, from which the count begins anew. Upon every additional 18th placement from the opal sits a bead of red jasper, while at every alternate repetition of its placement the red bead is moved to position 19, that is, one over from where it would normally be found, and again moved one extra position every eighth repetition. At the 335th placement is to be found the larger bead of fiery opal that begins the strand once again. Dangling from amidst the strand of beads is a medallion inscribed with a symbol, a representation of the footprint of a swan. Each pearl is a significator of one year’s accumulation of Full Moon cycles. The beads of blackest jet (with each crystal bead equating with an additional day beyond the 8th moon) represent – and map as a calendar – the moment in the Moon’s passage when it will Walk Upon the Land at the time of the greatest Lunar standstill. Each bead of red jasper charts the moment in time when a lunar eclipse will occur in the seasons of time. The 335th placement, which is both the Beginning and Ending of the necklace, marks the convergence of the lunar standstill and a lunar eclipse. The Sacred Man moves the medallion one bead forward. Having done so he moves in joyous yet precise movement, spinning to the left as he progresses in his steps towards the Three Tall Women. As he dances he weaves betwixt them, from the left to the right. As he approaches each, in turn, of the Sanctified Women they dance with him, a flurry of spinning motions along with swooping with arms outstretched, indicative of swans in flight. As the Sacred Man – now the embodiment of the Moon, of Mén-zu, the Sacred Man of Fertility – slowly moves from one Goddess to the next, above them, as witnessed by the chanting group of the people, the Moon is seen to roll low across the sky touching the tip of each of the Three Tall Women stones in the very same moment that the well-practiced dance of the Sacred Man/Mén-zu is proceeding from one stone to the next, from Maiden to Mother to Elder Woman. Now that the Rite of Mén-zu has been activated, and the charge of Power transferred to the Three Goddesses, the people bring forth offerings to each Goddess according to the item they desire to be blessed. To the Maiden are brought gifts of sweets and ribbons, flower woven wreaths and strands of colorful hand-wrought beads, all representing the wondrous and joyful elements of life. At the feet of the Mother are placed dolls wrapped in swaddling, figurines of sheep, sheaves of grain and other items representing the request for the blessings of nurturance and surety of abundance for the families and the clans. To the Elder Woman are brought horns filled with beer; icons and effigies of spiritual figures sacred to the people, carved of stone, bone, ivory and antler; leaves wrapped around sweetmeats and tallow. To her are presented the items that represent all that the people hold as sacred and necessary to sustain them in their spiritual life. Upon the standing stone of Mén-zu the people now swarm. Men, who seek to enhance their virility to be able to have children, lay at the base of the rock, the phallus of the rock imagined as their own. Women, who wish to conceive, climb to the top and sit thereupon, to receive the essence of Mén-zu’s fertilizing vital force. A feast, in celebration of the gifts of abundance that Mén-zu has made possible, follows. Revelry and song, dancing and storytelling continue until the Sun has risen. For those lovers who have slipped away in the night, the children born of this night’s union will be held with reverence as the Children of Mén-zu. These children will become the next generation of Sacred Women and Sacred Men. The story accounted above is recited from the Far-Telling, the memories that are passed down from one lifetime to another, memories based in witness and participation. It tells of a time – in what now is called the Paleolithic into Neolithic eras – when humanity celebrated our intimate engagement with the cycles of seasons, Moon, Sun and stars. In that era the Moon was held to be Masculine, the Grand Inseminator, who, every 18 years and 8 months would return to walk the earth. This is a phenomenon still visible today at the standing stone circles of Callanish, Scotland, where this described event takes place. It is referred to as a lunar standstill. Due to the high latitude and the Moon’s rising so far to the north at the standstill, the Moon’s arc does not lift overhead, but is low to the horizon, giving the appearance of the Moon ‘walking’ upon the land. At Summer’s beginning, with the rising stars of Deneb, Vega and Altair (the Summer Triangle) visible above the Eastern horizon the Moon seems to roll, or dance, through the triangle. Each of these celestial elements are embodied mythically in the characters of the ceremonial event as well as by the positioned stones that have been set with precision to mirror the stars and Moon above. Indeed, all authentic Shamanic ceremonials are the dramatic expression of cosmological phenomena.